HÀ NỘI — Virtual art is still a new concept in Việt Nam, but Manzi Art Space in Hà Nội has launched recently Into Thin Air 2 – an art in public project which offers art lovers a completely new way to enjoy art. By using Into Thin Air 2, users don’t need to visit museums, galleries or exhibitions to view art. 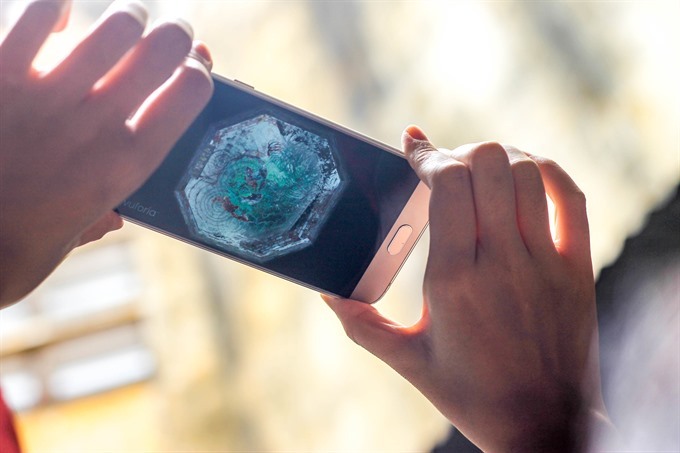 Instead, they can view and interact with artworks through a free online application using augmented reality (AR) technology which can be downloaded from Apple App Store or Google Play Store to their phones or tablets. All artworks exist virtually and are only accessible on a particular site. According to the project’s initiator and founder of Manzi Art Space, Trâm Vũ, by using a virtual platform, the artworks will exist forever. “You could say that Into Thin Air is a never ending art exhibition,” she said. A long-term project initiated and curated by Manzi, Into Thin Air aims to build awareness and appreciation for art – particularly contemporary art – among the public. The project also helps artists develop independent practices whilst encouraging their involvement in social development. In addition, it takes artworks from museum, theatres, galleries onto street and public spaces. “A public space is a space that does not belong to anyone, but at the same time, to all. It is a site that doesn’t just hold its inhabitants’ history and memory, but also reflects their personal and collective identity. It is a place that is often neglected or forgotten, but has the potential to become a zone for creativity and freedom,” Trâm explained. To implement the project, Trâm looked for artists "who were open-minded and dared to try something new that they had never tried before", she said. 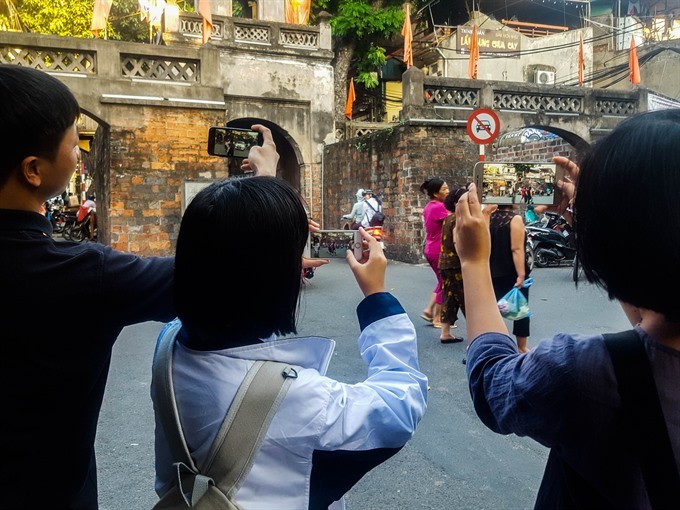 The artists were asked to consider their everyday urban spaces in Hà Nội that were significant to them and their community, and create an artistic piece for those spaces. Aiming to make the artists become more open and socially engaged, the project looked for works that the public could interact with, such as the city’s historical, political and social nature. 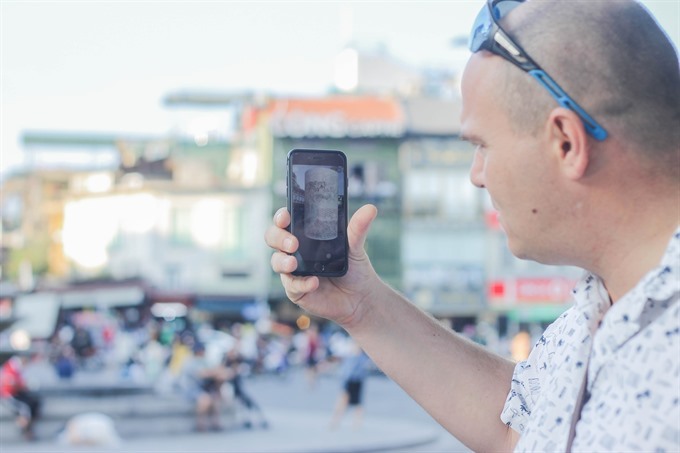 Thirteen Vietnamese and international artists joined the Into Thin Air project, creating 10 artworks which exist virtually in several public venues across Hà Nội such as Đông Kinh Nghĩa Thục Square, Bà Kiệu Temple, Ba Đình Square, Hôm Market, Quan Chưởng Gate, Lenin Park and the Botanical Gardens. Inspired by Quan Chưởng Gate, one of the oldest structure in Hà Nội’s Old Quarter, which in the past was a main entrance to the royal citadel, professional dancer and choreographer Vũ Ngọc Khải created a seven-minute dance piece entitled The Wanderer. Creating a trip back in time, it is the artist’s search for his identity. Living in Europe for more than 10 years, Khải finds himself a stranger in his hometown. Where does he belong to? The city is changing fast and so is he. Has he left anything besides his childhood memories behind the gate? Visiting Quan Chưởng Gate, viewers are able to see the dance piece, which is available in day and night mode following GPS timelines. Musician Trí Minh created a soundwalk named D4 – A Memoir of Shadow based on his memory about the Nam Đồng living quarter in Đống Đa District where he lived during his childhood. The Soviet-style apartment area was built for military families in the early 1960s. It is now one of the most densely populated in Hà Nội. Having grown up in this area and inspired by his childhood memories, Trí Minh created a sound scape that conveys the recollections of a boy from the 1980s to a 21st century virtual world. His work is a story of the past, present and future – a never-ending story of real life and illusion. The US-born artist Nguyễn Oanh Phi Phi, who, in 2004, received a Fulbright Grant to study lacquer painting in Hà Nội, has created a virtual installation at a lightwell in Hôm Market in Hai Bà Trưng District. Through the work, entitled From Below, Upward, the artist points to the challenges of finding unclaimed and unprofitable spaces in the chaotic environment of a densely populated city and to the sense of detachment created by this urban habitat among migrants from rural areas. In Hôm Market, fabrics, cheap clothing, food and general knick-knacks occupy every square metre of this commercial space except the sky well. Phi Phi Oanh utilizes this disregarded of interstitial space to create an image of a fish pond, projecting the gaze of the viewer from the urban setting into a nostalgic landscape. A microcosm in constant motion, a fish pond has a symbolic place in village architecture that evokes nostalgia among many Vietnamese. In Oanh Phi Phi’s work, it is an inherited nostalgia learned from the stories of her father’s childhood and his memories of free play and endless time. From Below, Upwards, references Di sotto in su – a type of Baroque ceiling painting with figures painted on a ceiling or other high surfaces to give the illusion that the figures are suspended in air above the viewer. Here, playing off the bodylessness of the augmented reality, the source of this image file is lacquer painting on glass, a surface the artist has used in previous projects to experiment with dematerialisation and projected scale. Into the Thin Air 2 also features other dance pieces, soundwalks, video art and installations by artists including Nguyễn Huy An, Tạ Minh Đức, Jamie Maxtone-Graham, Huy Trần, Cao Thanh Lan, Gregor Siedl, Maritta Nurmi, Nhung Nguyễn, and Christian Grothe. Since its launch on October 7, the Into the Thin Air 2 app has been downloaded 10,000 times. “It’s an optimistic sign showing that the app is being greeted by people. However, it’s still too early to talk about the results,” said Trâm. Into the Thin Air 2 has been implemented with the support of the UNESCO Vietnam, Goethe Institute, and the Embassy of the Netherlands in Việt Nam.